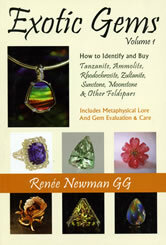 Profusely illustrated, Exotic Gems I helps you see and understand gemstones. Detailed information about the pricing factors used for colored gemstones and gemstone appraisal. Then detailed descriptions for rhodochrosite, zultanite, sunstone, moonstone and other feldspar gems. You will know a lot about these gems when you read Exotic Gems I! This book is a 6" x 9" paperback with 153 pages. What does an Insurance Appraisal Include?